In the early 1900's steam generated DC electricity was introduced. Rail-mounted wagons hauled by wire ropes and discharging from 'high backs' were being widely used in open pits. In the 1920's and 1930's some of the clay companies experimented with new working techniques and equipment. Advances were made by The Devon & Courtenay Clay Co. in the technique of sinking shafts through waterlogged sands, using techniques developed in the trenches of the First World War. This permitted hitherto inaccessible reserves to be worked. Devon & Courtenay in South Devon and the Meeth Clay Company in North Devon drove the first primitive 'adit' mines to follow seams from the bottom of existing pits. Steel arches were introduced in Meeth to support the main drives. In 1929 The Newton Abbot Clays introduced the first steam excavator. 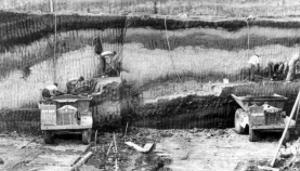 Draglines were also introduced, potentially allowing the removal of greater thicknesses of overburden. 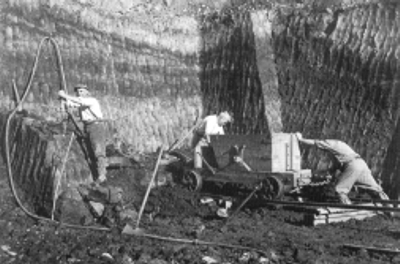 Extracting clay from an open pit in North Devon in the 1930s. 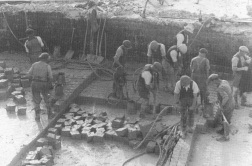 The traditional system of cutting clay into cubes is still being used, but pneumatic spaders have been introduced to replace thirting irons for making vertical cuts. Lumpers are still being used to undercut the cubes. In the early 1930's, Newton Abbot Clays, followed by Devon & Courtenay and The North Devon Clay Co. introduced the first (very heavy!) hand-held pneumatic spaders to replace the thirting spade in the cutting of clays in open pits. Newton Abbot Clays experimented with a china clay-type 'sky tip' for waste (using an inclined railway), and, in 1937, introduced the first 2-3cu yard Muir Hill dumpers in their open pits. .it would be difficult to find any industry in this country where there has been so marked unawareness and such lack of initiative on the part of many producers to modern industrial change'. One of the Board of Trade's principal recommendations to increase productivity was to fit rubber tyres to the wheelbarrows used underground! The industry's problems were compounded by a shortage of manpower as a result of many able miners having been called up for military service, and the difficulty of recruiting ex-servicemen into such a backward industry. Ruston Bucyrus 19-RB face shovel loading a Dennis Pax lorry from a sockpile at White Pit, Preston Manor works, Kingsteignton, c. 1950. This situation was soon to change remarkably, so that by 1969 one of the clay companies, Watts, Blake, Bearne & Co., was to be a recipient of the Queen's Award for technical innovation in underground mining. 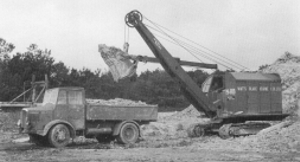 In the open pits, diesel powered face shovels, dumpers and lighter pneumatic spaders became commonplace during the late 1940's and early 1950's, relieving the workers of the hardest physical labour. Newton Abbot Clays - which had the problem of bringing clay out of constricted, steep-sided pits - installed 'Blondin' suspended wire rope systems to lift the clay out, but the company suffered a disaster in 1961 when one of its pits flooded, and the Blondins were subsequently replaced by dumpers. Open pit mining at WBB's Southacre pit, Preston Manor, Kingsteignton, c. 1960, using pneumatic spaders and 3 cu. Yard Muir Hill dumpers running on timber railway sleeper roads. In the 1960's bucket wheel excavators were introduced but were phased out in favour of hydraulic excavators that had the power and accuracy, in the hands of an experienced driver, to extract the most plastic seams to within a few inches of the bottom of the seam - minimising waste. Underground, the lighter (but still heavy!) pneumatic spaders also became standard in the late 1940's, largely replacing the tubil. Extracting clay from an open pit in the 1950s. The clay is now being dug from a vertical face rather than the floor of the pit, using pneumatic spaders instead of thirting and lumpers. Rail mounted wagons are being used to carry the clay up 'high backs' where it was tipped into heaps. 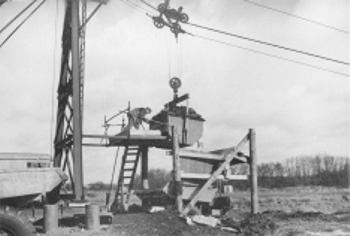 Blondin aerial cableway used to raise buckets of ball clay from Newton Abbot Clays' open pits. The bucket is about to discharge from a side door into a waiting dumper.